Once upon a time in a land high above there lived a goblin who enjoyed creating strange things. Once he made a wicked mirror, which reflected beautiful as ugly and good as bad. 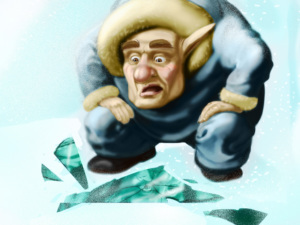 Unfortunately, he dropped the mirror, and it fell on the Earth and broke into many pieces. 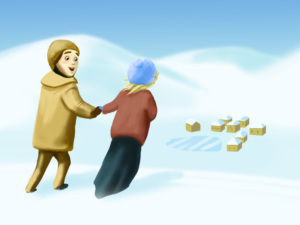 Close to the place where it fell, there lived two good friends - Kay and Gerda. The two kids were neighbours and they were playing all day long until their parents called them for dinner. 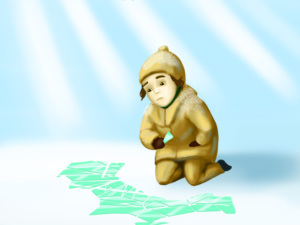 One winter day as they were playing with snow balls, a few of the pieces from the broken mirror hit Kay in the eye and another one - pierced his heart. That incident changed Kay very much and he didn’t play with Gerda anymore. The few times they met by accident Kay was teasing her like they were never friends before. His attitude was completely strange and Gerda couldn’t understand him at all but she believed that he will come back to her sooner or later. 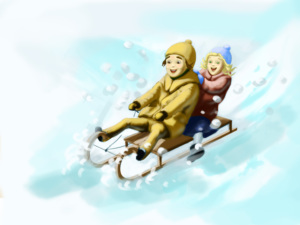 One day Kay and his friends went on a sledge ride. The sledges stopped one after another and the boys were jumping in, until it was Kay’s turn. The sledge, which stopped in front of him, seemed huge compared to the others. The driver asked him to get on and as soon as he hopped in, Kay saw to his amazement how the driver turned into a woman. Before he could even scream, she pulled the reins and the horses sped away in no time. 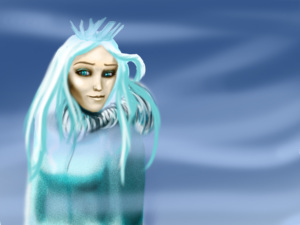 The woman was beautiful in a very cold way - her gown was white and long and she had a crown made of ice, which didn’t melt. Although she looked young - her hair was white, falling over her shoulders like iced water. “Who are you?” Kay asked the unknown lady. “Oh, I’m the Snow Queen! 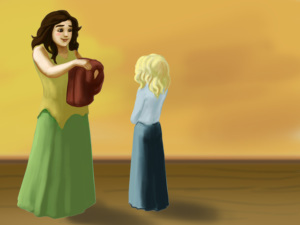 Nice to meet you, Kay!” she said and tugged the reins with such a strength one would think she wasn’t a human. The horses and the sledge headed upwards to another land over the clouds. Kay’s friends got very worried when they couldn’t find their friend at the end of the ride. They went straight to his parents to check if Kay had come home earlier but they said that they hadn’t seen their son since the morning. Knowing how good friends they were with Gerda, Kay’s parents went to ask her. 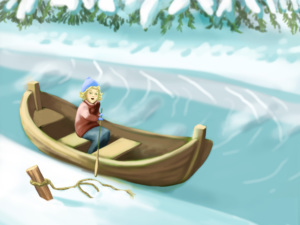 Gerda knew nothing of Kay’s missing but when she heard that her old friend was missing she decided to look for him in the river where they used to play. She arrived at the banks, where her boat was, untiеd it and sailed away in search for her friend. She yelled Kay’s name to all directions but only the sparrows answered her. Gerda was starting to lose hope when she passed by a cherry-orchard, where was a little cottage with funny red and blue windows. An old woman came out of it and asked Gerda, who was Kay and so Gerda told her the whole story and how she had ended up yelling before her window. The woman invited the poor child in her garden, where flowers of all sorts were growing. 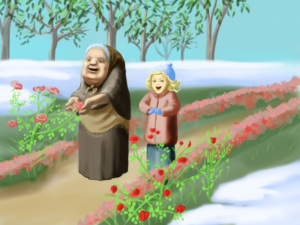 “What a lovely garden you have!” exclaimed Gerda. “These are the most beautiful flowers with the most exquisite adour, which I have ever seen!”. “My flowers are not only beautiful but each of them can tell you a story. Why don’t you ask them about your friend?”said the woman. So, Gerda asked each of the flowers about Kay and they all told her their story, but none of them mentioned anything about the boy and so she left the house in sorrow. Feeling helpless, Gerda sat under a tree and started crying. 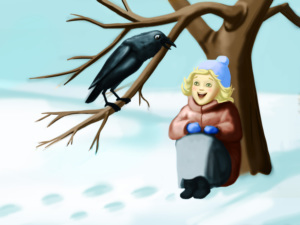 She cried and cried until a crow alighted on a branch next to her. He asked her why she was crying and Gerda told him too her story. “So have you seen him?” asked she when she was finished. 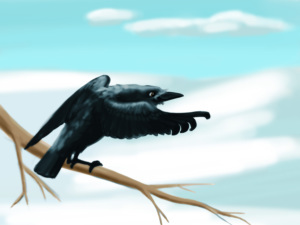 “Have I seen whom?” asked the crow. “Kay!” said Gerda impatiently. “Yes, this must be Kay! He had his new boots on when he went to the ride. And he is so clever that he can please a Princess...Lead me to the palace, I want to make sure that’s him!” And so Gerda and the raven headed to the palace. 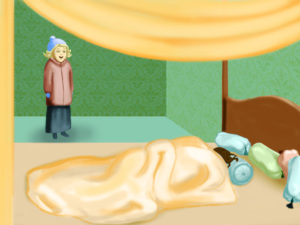 When they entered the bedroom where the princess and the new prince were sleeping Gerda approached the bed anxiously. 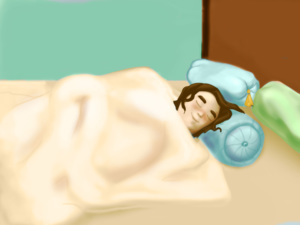 The sleeping prince had the same hair as Kay. He rolled in his sleep and thus turned his face towards Gerda. She sighed in relief, because it wasn’t Kay, but another boy. As happy as she was that Kay had not married another one, Gerda left the Princess’s palace saddened, because she hadn’t found her friend yet. 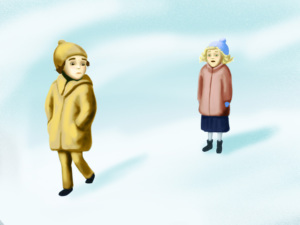 Wandering in the woods in search for Kay, Gerda came to a robber girl and her reindeer. They thought that she was lost at first but then she told them her story. 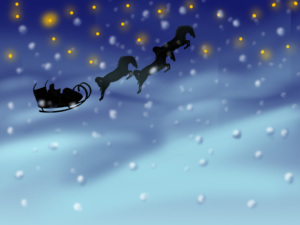 “I saw your friend!” said the reindeer. 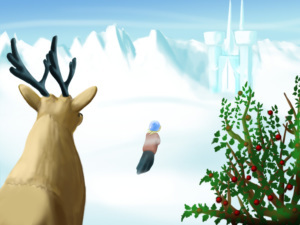 “He was taken by the Snow Queen - I saw them flying by on her sledge and I believe they were going to Lapland where it is always cold and...I can take you there if you want.” Gerda was overjoyed with the news and thankful to the reindeer for the help he offered. 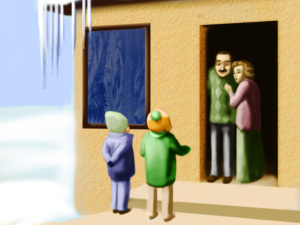 That night they stayed with the robber girl’s people who gave her food and a bed to sleep on but Gerda was restless. 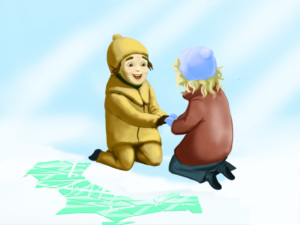 The next morning when it was still dark the robber girl helped Gerda sit on the back of the reindeer and the two left for Lapland. They were travelling all day long when they saw a cottage in the middle of the forest and decided to look for a shelter for the night. Before they had even knocked on the door, it opened. Gerda was so tired for she hadn’t slept the night before. 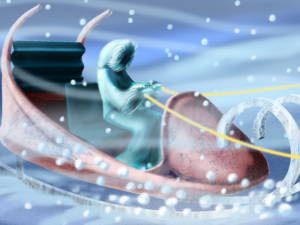 As soon as she fell asleep the woman, who was also a magician, told the reindeer: “There is a small problem - thanks to the glass pieces in Kays eye and heart - he believes that the Snow Queen’s palace is the best place for him.” “But how will she fight the Snow Queen? 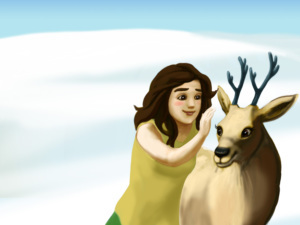 Can’t you make her some weapon or potion so that she becomes stronger?” asked the reindeer. 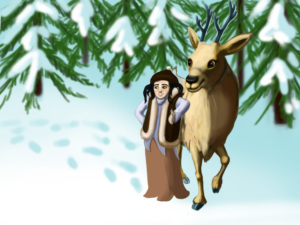 The woman placed little Gerda on the reindeer’s back and off he ran as fast as he could. 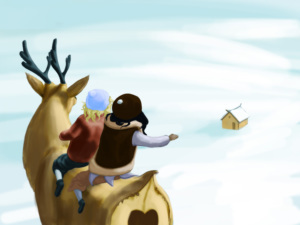 They reached the bush and the reindeer told the girl that she should continue on her own. He kissed her on the forehead and wished her luck. 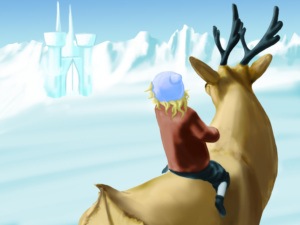 Gerda started running barefooted on the snow until she reached the castle. Its walls were made of snow and it’s glasses were of ice, through which the northern lights were penetrating inside. 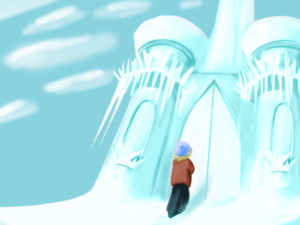 No one else but the Snow Queen and Kay lived inside. 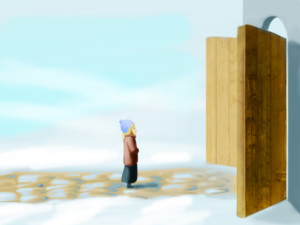 Gerda stepped into a large hall where she finally found Kay! But he was not the same Kay she knew - his body was almost blue from the cold and his eyes were looking empty at her as if he didn’t recognize her. 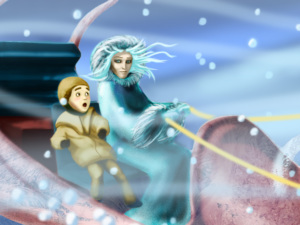 The Snow Queen had removed all human feelings from him, including the feeling of cold. He was playing with some pointed pieces of ice - organized them and reorganized them as if he was trying to write something with them. The sight frightened Gerda so much that she hugged him and wept quietly. One of her tears fell on his chest and went right into his heart. It immediately melted the ice cover around. Another tear fell on his face and went right into his eye, so his sight went back to normal. 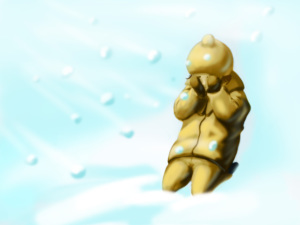 Kay looked around him, “How cold it is here!” he said “And empty!” he added. Only then he saw his long lost friend Gerda and wept aloud. One of his tears fell on the ice chunks and at once the word ETERNITY was spelled before them - this was a task by the Snow Queen. She had promised to set him free if he solved it but he couldn’t, because of the crystal in his eye. 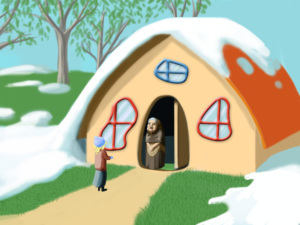 Now that his little brave and caring friend had set him free, they left the palace right away.On their way back Kay and Gerda went by the magician to thank her about the food and bed and by the robber girl to thank the reindeer. Then they went to see the Princess and the Prince to tell them how it all ended and last but not least they stopped by the lady with the talking flowers to thank her too. Everyone was so happy about them and they all waved goodbye with their eyes all wet from the happy ending. Finally they went home and they lived happily ever after.